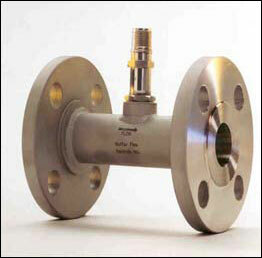 After the measurement of water, natural gas is the single most frequent fluid measured by Hoffer turbine flowmeters. A significant number of Hoffer turbine meters are used in the custody transfer segment of the natural gas industry but many are used by this industry for other applications. The transportation of natural gas over great distances is a complex task, requiring specialized equipment and facilities to deliver the gas safely, efficiently and in a ready-to-use form. Considerations include maintaining sufficient pipeline pressure, maintaining pipeline integrity and keeping moisture levels low. 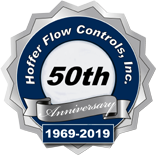 Hoffer’s gas transportation clients have found our turbine flowmeters well suited for supporting a number of these tasks. One of the most critical elements in transporting natural gas is maintaining sufficient line pressure from the wellhead to the pipeline delivery points. Compressor stations along the length of the pipeline supply the needed boost in line pressure to maintain flow at desired levels. A critical flow measurement in these stations is the circulation of cooling fluids used in the engines and compressors to remove excess heat. Failure of a cooling system can lead to emergency compressor shutdowns, equipment damage and loss or significant reduction in pipeline pressure. Hoffer turbine meters are on the job in several such stations monitoring the flow rate of these critical cooling fluids in order to alert personnel of either a gradual or sudden drop in flow that would require attention. Pipeline integrity is a major safety issue. Gas transportation companies employ elaborate methods to monitor and inspect pipelines for possible leaks or future leak points. One technique used in this mix in many pipelines is the use of non-custody transfer Hoffer insertion turbine meters to monitor flow rates at points along the pipeline. The insertion meter technique requires sufficient density and velocity to work properly with gas flows. This is the case for most gas transmission lines. By monitoring flow rates at various points along the pipeline, it is possible to determine if there are any disparities in the flow rate between points that would indicate a potential leakage problem. By using bi-directional Hoffer insertion turbine meters it is also possible to determine direction of flow which can be important in monitoring pipeline integrity in more complex configurations. A final application for Hoffer turbine meters is the monitoring of glycol flow rates associated with gas dehydration operations. Dehydration equipment typically utilizes heated glycol to react with water vapor present in the natural gas and remove it from the flow stream. Significant volumes of glycol are required for these operations and need to be accounted for. In these applications, Hoffer turbine flowmeters are ideally suited for their ability to handle a wide range of flow rates and temperatures from ambient to in excess of 300°F associated with these operations. Though the Hoffer turbine meter is perhaps best known for custody transfer applications in the natural gas transportation industry, as we can see there are many other places in this industry where they are successfully utilized. Natural gas transportation companies around the world have found the versatility, reliability and cost effective nature of the Hoffer turbine meters ideally suited for these auxiliary requirements.